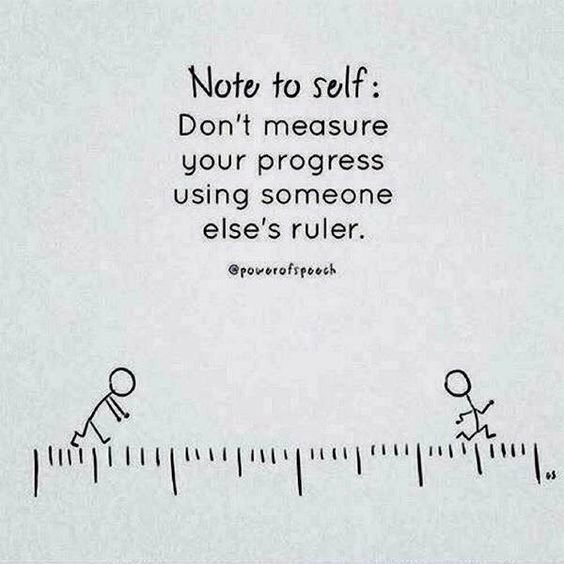 Don't measure your progress using someone else's ruler. My parents raised me and my siblings to always put 100 percent into what we do and to try our best in everything we do. So, whenever I got a bad grade, they weren't necessarily happy, but as long as I tried my best, it was OK and they worked with me to figure out how I could do better next time. It didn't really matter to me, and it still really doesn't today, what people got on their tests or the grades that they got on their report card. What mattered to me was my grades, not theirs, or so I thought. While my parents never put pressure on me to get straight A's, somewhere in the back of my head, I did, even without realizing it. The pressure was healthy, though. It motivated me to study and to want to do well. So when I started college, I knew that it would be competitive, but I assumed that I would be fine. I knew how to study, had gotten good grades in the past and managed my time well. My freshman year flew by and I did well. I adapted my organization, studying and time management to the life of a college student and rarely ever thought about how I was doing in classes in relation to others. What I never really thought about was that little voice in the back of my head. When I chose nursing as my major, I knew that it would be super competitive, but I didn't really experience any of that freshman year. I truly had no idea how competitive it was until I realized this year, my sophomore year, how it affected me. The competitiveness amplified the voice in my head and not in a good way. It got louder and louder, as if it was yelling with a bull-horn until it got to the point where I found myself in tears trying to take blood pressure. Seeing others able to complete tasks with no problem and me not being able to, unbeknownst to me, gave that voice a bull-horn. Listening to people talk about all that they do around campus on top of the hours of work that we have to put in, turned on the bull-horn. Comments made by people that knew what they were doing, to myself and other friends gave the voice in my head a louder voice. Also, my desire to do well and not being able to right away made it OK for that voice to use the bull-horn. I had done what I always thought I didn't. I compared myself to others and that, together with the bull-horned voice in my head, broke me down and increased my stress by infinity. I realized that I needed a way to turn off that bull-horn. I remind myself that I need to do things at my own pace and not at the pace of others. It doesn't matter if it takes me longer to get something than others. I have to do what is best for me to learn. That turned off the bull-horn. I reminded myself that I am not alone and that everyone struggles to learn things, even if they don't admit it. As I began to talk to my other friends that are also nursing majors, I realized a lot of them felt the same way that I did. That took the bull-horn away from the voice. I have learned not to let people lessen what I have accomplished or what I am doing. I also learned to accept that it is OK to not get that A. As long as you put 100 percent into what you are doing and try your best that is all that matters. That told the voice to lower its voice. I learned that you don't need to get all A's or make the Dean's List every semester or be a part of every single club or board on campus or be able to get everything on the first try to be successful. Just because other people do these things doesn't reflect badly on you or make you any less successful or smart or able than them. After I reminded myself of these things, the softer and softer that voice got in my head. It is not totally gone, but it is back to that healthy indoor voice that we were told to use as kids. It takes time and it is certainly not easy, but each time you remind yourself of any of these things, the volume dial of the bull-horn gets turned down one more notch. Someone that understands and that is right there with you.